Bedside emergency department (ED) ultrasound (US) provides critical information to clinicians by non-invasively, rapidly determining various anatomical structures . The sonographic diagnosis of acute sinusitis (AS) has been studied, and a wide range of sensitivities and specificities for the diagnosis of AS by US has been reported [2, 3]. The authors present a case of sinusitis diagnosed by US in the ED. A 32-year-old woman presented to the ED with a history of fever, sore throat and nasal obstruction of 5-day duration. She denied any cough, fullness of face or headache. The vital signs of the patient were normal except for fever of 38.6°C. 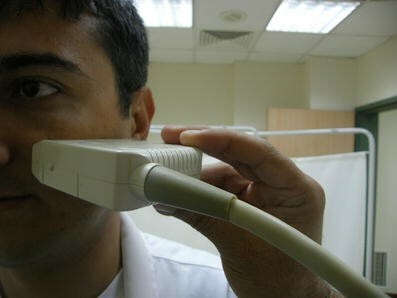 Physical examination was normal except for pharyngeal erythema. Since there was a nasal obstruction in her history, this finding led us to think that the patient might have an acute sinusitis (AS). In order to strengthen our diagnosis, we decided to perform an US examination since it is an easily performed, rapid, cheap, noninvasive and non-ionizing method. Figure 1 demonstrates a normal maxillary sinus. Bedside US examination was performed according to the method described by Revonta (Fig. 2) . An increase in mucosal thickness and decrease of aeration in both of the maxillary sinuses were shown both with bedside US (Fig. 3) and paranasal sinus tomography (Fig. 4). The patient was discharged from the ED with antibiotics, oral paracetamol tablets and a nasal decongestant. US, while operator dependent, can be a useful tool to reduce the number of unnecessary tests ordered and thus aid in a rapid diagnosis and therapeutic interventions. This study was supported by the Akdeniz University Research Foundation.